contract basis only. 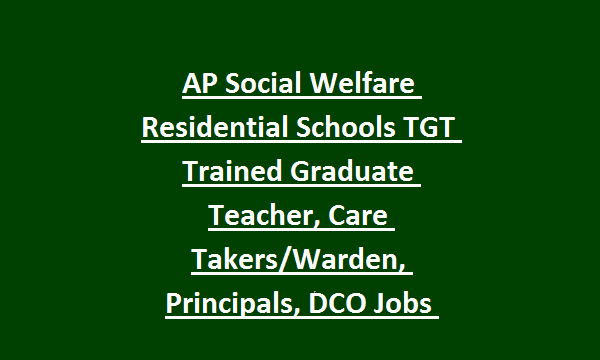 Online application link will be active from 14-02-2019 and last date to apply online for this AP Social welfare Residential Schools TGT, Care takers jobs is 28-02-2019. Official website to apply online is jnanabhumi.ap.gov.in. 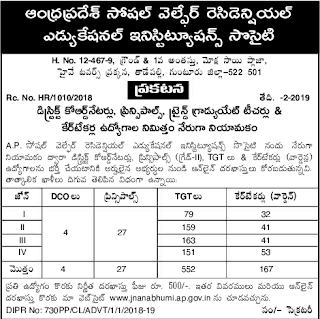 Candidates selection will be on basis of written exam and documents verification for this AP Social Welfare Residential Schools Recruitment 2019 Post wise vacancy details, qualification and other information is updated below. 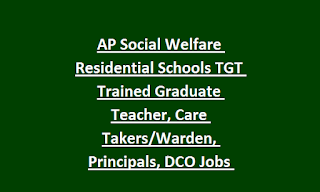 There are total 750 posts are in this AP Social Welfare Department Residential Schools Recruitment of Non Teaching and Teaching staff. For all the posts upper age limit is 44 years as on 01-01-2019. Age relaxations are applicable as per the norms. For SC/ST/BC candidates 5 years of age relaxation is applicable. 1. DCO District Coordinator-Post Graduate Degree with 3 years administrative experience. 2. Principal-Must have at least 10 years experience as a Teacher with B.ED/M.Ed and PG/Degree. 4. Care Taker Warden-Any Degree with B.Ed or its equivalent qualification is required. 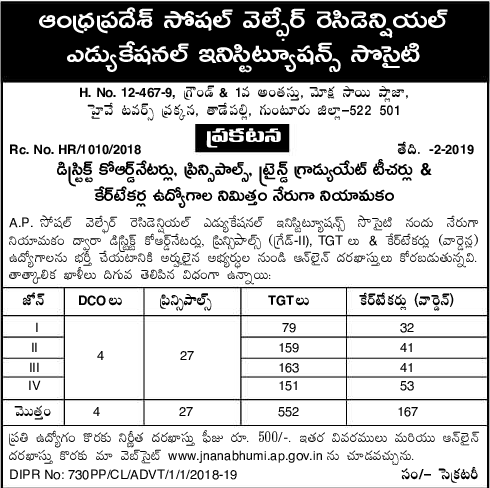 Candidates selection will be written exam, document verification for this AP Social Welfare Dept Recruitment 2019. Computer Based online test will be conducted for this AP Social Welfare TGT, Care Taker jobs. For all the posts written exam will be conducted for 150 marks. Paper 1 is English proficiency Test. Candidates must have qualified Paper 1 and Paper 2. Paper 1 marks are not considered for final merit list. Paper 2 marks are only considered for final merit list. Online applications are accepted for this AP Social Welfare Residential Schools through official website of www.jnanabhumi.ap.gov.in. Candidates must have apply online only before the closing date. Please refer notification. It will be available in 2 or 3 days. Hi, my qualification is PG(MCA) and having experience in IT, am I eligible for any position..?? Probably No.. But wait for APPSC Computer Assistant vacancies, which are pretending to release.